When someone harms you or someone to whom you have a sense of responsibility, getting suitable justice, or ensuring that the perpetrator is punished is not always easy. In Hinduism we have the concept of karma, so if justice is not easy to come by there is a temptation to feel that even if we do nothing, the perpetrator will still get the punishment they deserve through the law of karma, if not now, then at some point in the future. I’ve often pondered the intricacies of whether we have an obligation to ensure justice and punishment to those who carry out harm to others, be it physical, emotional, sexual or financial, especially how to tackle those who routinely hurt people. I realised that apathy which uses the law of karma as an excuse cannot withstand logical scrutiny. If an aggressor does someone harm, their karma will at some point in the future cause them appropriate negative consequences. However a pure act done for the motive of bringing them to justice is far preferable compared with leaving karma to run its course. First of all, acts done for the sake of justice, especially when untainted with rage and other negativity, are positive acts that have positive consequences for self and society. Also, positive justice arrests a karmic chain of events that has been set into motion, which will force the universe to otherwise need to create a suitable retributive scenario for that individual and perhaps other individuals at the same time who have carried out other negative karmas. Positive acts of justice thus remove part of the the karmic burden that is building up in society and may even stop something really devastating from having to happen to provide justice for individual and collective karmas that society was not capable of dealing with adequately. Many bullies and criminals habitually harm others. For us to ensure suitable justice or punishment to such individuals will make it less likely for others to suffer at the perpetrator’s hands. Dharma gives us duties to act responsibly, and if we understand the law of karma correctly we will see that there are negative consequences for actions that we should have done but failed to do. It is obvious that most people would like to get justice (usually through the law) when they or someone close to them is harmed. But sometimes it can be difficult and even dangerous. Legal processes can be slow and tiresome, and can even let us down. In some cases, persisting with trying to ensure justice may cause us to receive threats and put our safety at risk. It can be tempting to give up – but in truth we should persist where at all possible. It can be the most meaningful and rewarding part of someone’s life to persevere to ensure justice, even if it means difficult choices and consequences. Gotta disagree with the thrust of this one. 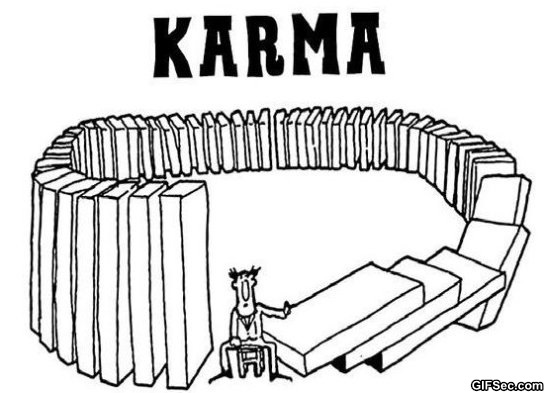 Whatever karma might be, I don’t reckon it equates with human concepts of justice, which are learned and culture-bound. The idea that ‘positive’ justice somehow creates ‘positive’ karma (or removes ‘negative’ karma) strikes me as simplistic. By acting to inflict your egoistic concept of justice on others you are simply creating karma for (or against) yourself. You can’t generate ‘unkarma’, you can only act in a karmaless way (i.e. without volition) as the karma you have already accrued discharges. That’s not to say you shouldn’t act for what you believe to be just. But you shouldn’t expect some kind of spiritual reward or merit for it or imagine that you are somehow ‘rebalancing’ the universe. As Krishna said, “You have the right to labour but not to the fruits of your labour”.